Home of Wear Earrings Again with Maggie's Creations - Non-Allergenic Jewerly, guaranteed! Welcome! I am so glad that you are here! My name is Maggie, and I have had my ears pierced since I was a child. As a woman with short hair, my pierced earrings are as much an essential part of my wardrobe as my shoes. In 1998, I developed an allergy to my 14k. Gold Earrings. My ears began itching after wearing earrings all day. I started having to take them out to sleep at night for the first time ever. This was inconvenient as I have 5 piercings, and have never had to take them out for sleeping or any other reason before. I thought it was just some sort of infection that I could wash away. It wasn't long before I could only wear earrings for a couple of hours and then the itching, swelling, and redness came back. In addition, my wedding ring and wrist watch began bothering me too. Being one who feels naked without my jewelry, I tried taking allergy medications and wearing them anyway, but this simply did not work. The itching, swelling, and redness, soon was accompanied by seeping, bleeding, burning and crusting. I tried cleaning my ears twice a day with rubbing alcohol (don't do this) and applying Neosporin to my ears (nor this). That was a Huge Mistake! Little did I know, I was making it worse! I developed an allergy to Neosporin , and didn't realise it until I used the ointment elsewhere! 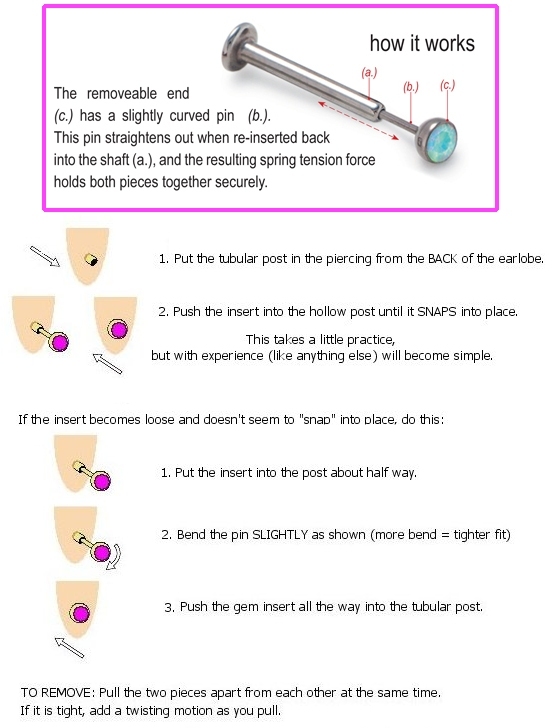 Eventually, just putting my earrings into the piercing became painful, as if the piercings were new and not healed. I tried switching to 18k Gold, Surgical Steel, "Nickel Free" earrings, even Platinum, but none of that helped. I tried clip-on earrings, but the moment I applied any metal to my ears, that old familiar feeling of heat, swelling, and intense itching came back. I further ignored my symptoms, and the rash that began on my earlobes eventually SPREAD along down the skin of my neck , and behind my ear to my hairline, and into my ear canal, where I developed an inner ear infection. My ears were an embarrassing mess. At this point I finally went to the doctor. The condition is called "Allergic Contact Dermatitis" (ACD) . It is caused by a "Contact Allergy". 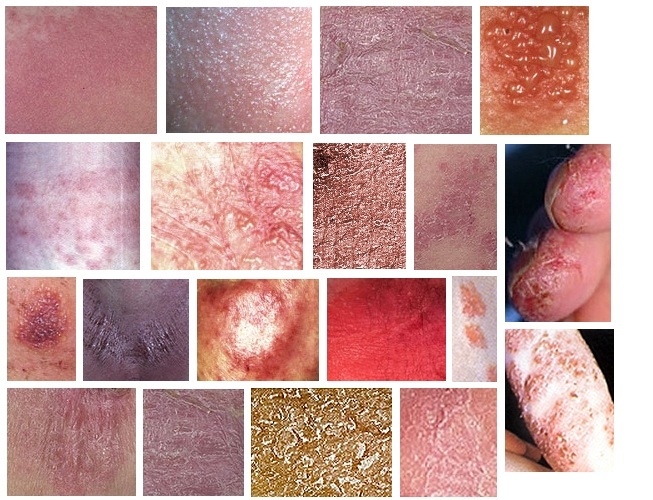 The rash (the symptom) is called "Dermatits" or ECZEMA and appears first at the point of contact. Doc said "no more earrings" .... I was crushed. I've been wearing them for decades, and really did not feel very pretty without them. Finally defeated I resolved to go without, which subjected my now raw ear piercings to closing up . Then in 2003, someone mentioned Titanium. This popular metallic element (as well as Niobium) is a pure and natural element like Oxygen, and found on the PERIODIC TABLE of pure elements. All I could think at first was "oh sure another metal to purchase only to be disappointed again". But missing my jewelry so badly, and feeling a tiny renewed spark of hope, I rushed off to the computer to research the subject. The more I researched metals and allergies, the more I learned about them and how they affect the human body. 1. I learned that an allergy can begin at any age but only affects those of us who are susceptible to allergies in the first place. I learned that it takes time for the body to perceive a substance as toxic, and this is why I was able to wear my gold jewelry for so long before becoming allergic to it. I learned that there is a specific list of substances called "potential sensitizers" that are prone to causing allergic reactions to those who are susceptible. And that any one of these potential sensitizers can become a full blown allergen much faster if they come into contact with already damaged skin (such as active eczema or an unhealed piercing/wound). This is how I developed an allergy to Neosporin, it is why some people don't develop an allergy to metals until they get their ears pierced, and why some can wear jewelry metals on their skin but not in their piercings. 2. I learned that traditional jewelry metals are not pure, but instead are a mixture of metals called "Alloys". I learned that "Alloys are especially prone to causing allergies due to an electrochemical reaction that happens between dissimilar metals in the presence of moisture" (even sweat or tissue fluids). I call this an "alloy allergy". 3. I learned that "Allergic reactions occur as moisture leaches chemicals or metal ions onto and under our skin" where our body can perceive them as toxic. 4. I learned that Titanium (in it's pure form) and Niobium, as well as very few other elements, are perhaps the most bio-chemically inert (compatible) substances on the face of the earth! Not only because they are Pure, but also because they do not break down when exposed to the fluids of the body, nor does our body tissues break down when exposed to these natural elements! 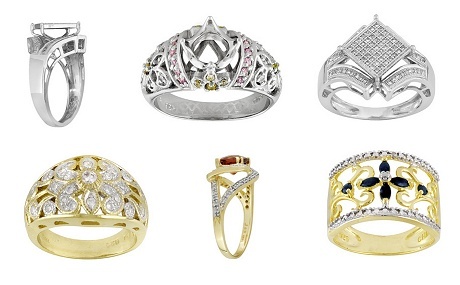 If jewelry metals are alloys because they are mixed with other metals, and they react against each other when they are in the presence of moisture, then I should be able to wear alloys like 14k gold ON my skin, if I can eliminate the presence of moisture and sweat and/or increase air flow, while avoiding all potential skin sensitizers. So, for an experiment, I traded in my wedding band of a solid design that sat flat on my skin, and replaced it with an "OPEN WORK 14k gold ring setting that provided plenty of air flow around my skin, coupled that with removing my gold for showers and washing dishes and voila it worked! But that still brings us back to the problem of pierced ears. There is no way to provide air flow in the piercing of an ear. So I began searching for Niobium & Titanium earrings. Well, manufactured Niobium earrings did not, and still do not yet exist on the market. And unfortunately, most manufactured Titanium found in the stores and piercing salons is one of the "Surgical Implant Grade Titanium" which is Alloyed Titanium, and I needed to stay away from all alloys until I healed my eczema and pierced ears. so I had to get pure Titanium and Niobium earrings. Surgical Grade vs Pure: Many people mistakenly consider "Surgical Grade" or "Surgical Implant Grade" to mean "upgraded, or better than regular grade". However, Surgical Implant Grade (SI) and Surgical Grade usually means that the metal has been alloyed in order to better meet the needs of the surgery, ie: shape, hardness, etc.. (otherwise, it would be called pure grade or commercially pure grade "CP"). S.I. Titanium (Grade 23) is alloyed with Vanadium and Aluminum (an allergenic metal). Surgical Steel was developed for Surgical Instruments, and is a special steel recipe alloyed with specific other metals in order to achieve a surgical tool that will stay sharper longer, with a harder more condensed surface which is easier to disinfect. Surgical Steel was never meant for jewelry at all, but here again jewelry manufacturers started using the material and labeling it as "hypo-allergenic" simply because it was being used in the medical field. So, "Surgical Implant Grade", or "Surgical Grade" DOES NOT mean more bio-compatible, if you suffer from allergies. Because I am an artist (talent God given), and because I have been able to obtain a little knowledge about allergies, and bulk quantities of Pure Grades of Titanium (not alloyed) and Niobium in raw wire and sheet metal form, I have created hundreds of Non-Allergenic wire worked earring designs to suit my needs and the needs of many others to "Wear Earrings Again" completely allergy free! A Little Knowledge About Contact Allergies: It is not so easy to keep away from all potential sensitizers while trying to heal our pierced ears. This is because all topical (applied to the skin) products that are used to clean new piercings, and even those used to help heal eczema and skin infections (including the prescriptions that the doctor gives us as well as over the counter medicines), are all on the common potential sensitizer list! Additionally cosmetics, hair spray, perfume, tissues, shampoo and conditioner are all on there too! My Motto: Put nothing on your ears that you wouldn't put into your eyes! Products such as Ear Care Solutions, Rubbing Alcohol, Anti-bacterial Soaps, Cortizone (Steroids), Neosporin and Triple Antibiotics, Benzocain/Benzocaine (or any "cain" medicine) and other topical anesthetics, are all on our list of "NO-NO's". When my doctor wanted to prescribe these medicines for me, I asked him for oral or intravenous treatments instead of the topical ones so to avoid further irritation to my skin. The one and only sure way of healing eczema, is by abstaining from contacting the allergen/s. If you continue to contact the allergen you can eventually develop a horrible condition called "Chronic Eczema", which will run it's course (sometimes for years) even when you finally do remove the allergen from your skin! Additionally, Chronic Eczema can come and go throughout your life time, running it's course each time, even if you have not re-exposed yourself to the allergen. Go to my ACD & ECZEMA RESEARCH page for more information. Niobium and Pure Grades 1-4 Titanium are not just hypo-allergenic, they are NON-ALLERGENIC ... I guarantee it! If your ears are currently irritated, they will take no longer to heal with Pure Grade 1 - 4 Titanium or Niobium in place, than they would take to heal with no earring in at all. Hypo-allergenic VS Non-allergenic: A hypo-allergenic product has reduced allergic potential compared to other like items in most people. Example: 14k gold is hypo-allergenic compared to 10k gold because less people are allergic to the higher karat of gold. But some people are allergic to 14k gold. In addition, the severity of any allergic reaction can be lethal. So hypo-allergenic does not pertain to everyone, nor does it promise a less severe allergic reaction to those of us who are allergic. Kind of like saying "will not cause a toothache in the toothless, huh? Hypo-allergenic is a term coined by advertisers (based on the Greek prefix hypo meaning "below normal" and first used in a cosmetics campaign in 1953. Although the term is known by all, and is even found in most standard English dictionaries, there is no official guidelines (in any country) that must be met before an item can be labeled hypo-allergenic and there never will be. Non-allergenic is also a term often used without official guidelines in labeling to govern the product. Yet the term is a definite, meaning "no allergy causing properties of any kind, for any person" . This term can only be proven if 0 people have ever, or will ever, have an allergic reaction to the item. Since the government is not willing to guarantee that statement, there will never be a guideline for this term either. So, buyers beware! Before you purchase an item from anyone that claims it is "Hypo-allergenic" or "more hypo-allergenic than other hypo-allergenic products" or "Non-allergenic", be sure that they are willing to put their money where their mouth is, and offer you a refund if it turns out to not be true for you. Anything less is simply a sales gimmick. 1. Start with a pair of Niobium or Commercially Pure Grades 1 - 4 of Titanium starter earrings available on my STARTER, SLEEPERS & HEALING EARRINGS page. 2. Follow the directions on my CARESHEET page without adding to or subtracting from them. 3. And keep all other COMMON POTENTIAL SENSITIZERS away from your ears. Once you heal your ACD pierced ears (or just get used to wearing earrings again if you don't currently have an active case of ACD) with my Non-allergenic starter & sleeper healing earrings in place, you can graduate to the prettier non-healing earrings that I offer, worry-free! Non-healing earrings do have alloys and other embellishments attached to them, but they are designed so that only pure elements touch your skin, and should only be worn during the day. This is key in preventing further allergies for us. It is not just the post that needs to be Non-Allergenic, it is also the clutch back and ALL components touching the skin. So what have you got to lose except irritated or naked pierced ears? Come on in, look around, and let me help you to Wear Earrings Again, with Maggie's Creations! My pure Titanium wire comes to me in a matte finish, and resembles brushed aluminum in both color and finish. My pure Niobium wire comes to me with a polished finish and resembles shiny gun metal, or a dark steel. Don't be slighted against Niobium simply because it is not as popular as Titanium. Niobium is exotic, pure, and feels as good against your skin as your favorite 100% cotton T-shirt. Both Nb and Ti elements are very strong like steel, yet half the weight, which makes them very comfortable to wear, and long lasting. They cannot be soldered and must be joined with cold techniques, i.e. rivets, nuts, bolts, epoxy, or special settings. 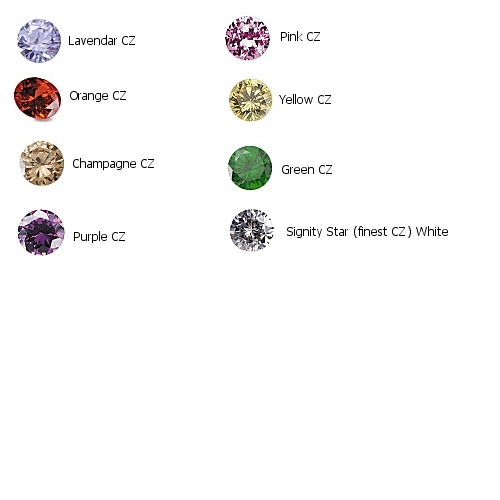 Additionally, both Nb and Ti elements can be anodized (colored ~ not plated) which opens up a whole realm of possibilities when combining these elements with other components (metals, gems, stones, beads, wires, charms, feathers, etc.). Many designs are available in an anodized antiqued golden finish. 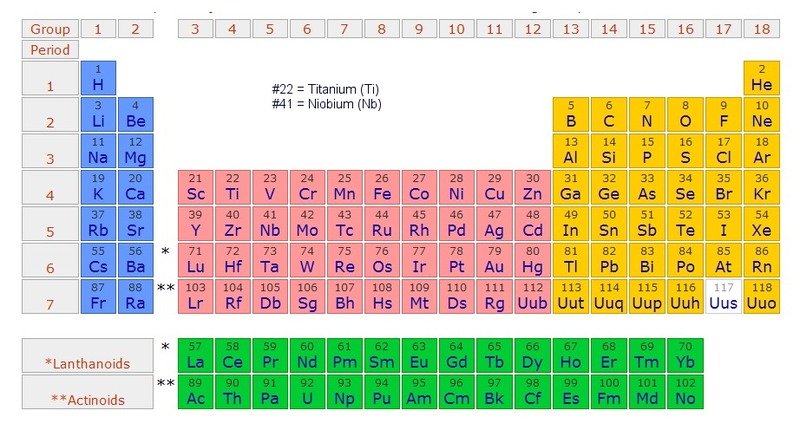 Titanium (Ti) is the 9th most abundant element in the earth's crust, and the seventh-most abundant metal. Many surgical instruments, implants, and body piercing jewelry is made with alloyed Titanium. 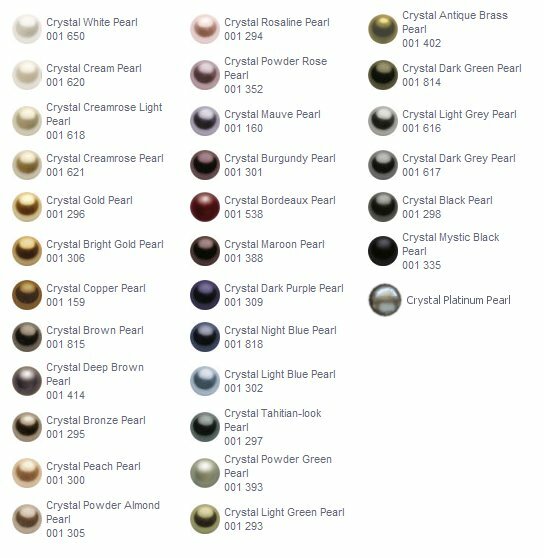 I recommend only Pure Grades 1-4 of Titanium for any piercing that is not used to wearing earrings whether with or without eczema. 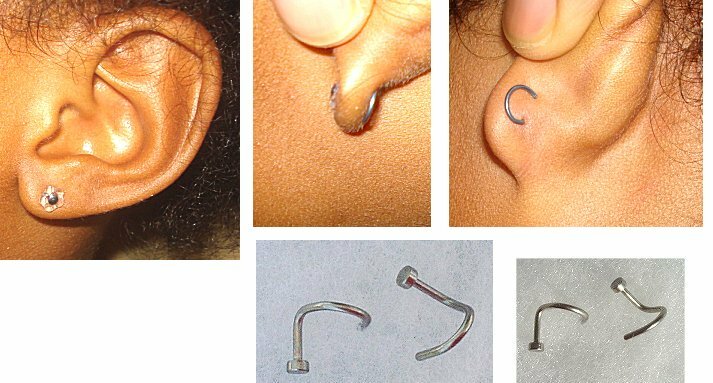 Once the piercing is healed and used to wearing earrings (it will have grown a layer of protective skin inside of the piercing) you will be more likely to be able to wear Alloyed Titanium, than not. Commercially Pure (unalloyed) Titanium is categorized into 4 grades. C.P. Grade 1 Titanium must be at least 99.695% pure, with the other 00.305% containing naturally occurring elements of; Nitrogen, Hydrogen, Oxygen, Iron and Carbon. Grades 2, 3, and 4 have increasingly larger amounts of these trace elements. Niobium (Nb) is very rare, only the 33rd most abundant element in nature. Niobium is 99.999% pure and cannot be broken down into further sub components. Niobium is three and a half times the price of Sterling Silver and five times the price of Titanium (as of March 2009). 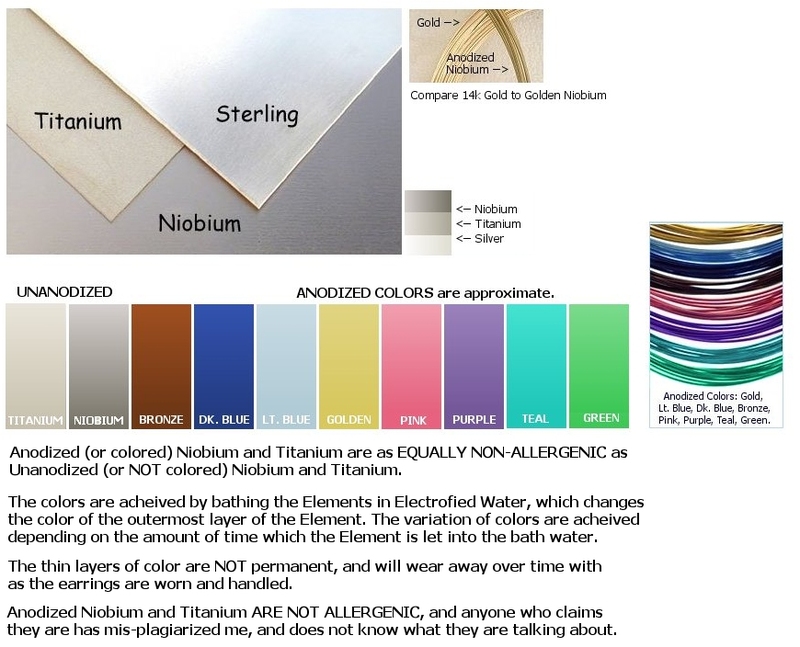 Additionally, Niobium cannot be upstaged for it's purity and in my opinion, it's Non-allergenic properties. See my NIOBIUM & TITANIUM RESEARCH page for more information. I have been wearing both of these elements 100% successfully since Spring of 2003, and I have no doubts about helping you to do so too! I am on call to share the experience of helping thousands of customers, with follow up services. I am "not" going to just sell you some earrings and let you figure it out for yourself. I will work with you until we find out what works for you. So come share my joy and, "Wear Earrings Again"!